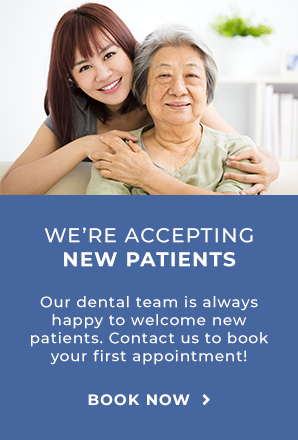 At the Markham Steeles Dental Centre we provide a range of general dentistry and hygiene services like cleanings, dental check ups and x-rays. Visit our office, conveniently located in the Scarborough Walmart at Markham and Steeles, today! Regular teeth cleaning and preventive treatments like dental fluoride treatments from our team of dental professionals in combination with your at-home oral care are so important in the maintenance of your oral health. Dental X-Rays let our dentists see what is happening with your whole mouth and are an important part of keeping your smile healthy. Tooth Crowns are used to fix damaged teeth and prevent further damage and pain. Tooth bridges are used to replace teeth that are missing or too damaged to repair. At the Markham Steeles Dental Centre, we offer dental Inlays and Onlays to replace cracked, damaged or missing fillings. If you are suffering from a decayed, cracked or damaged tooth, our dentist may recommend a filling. We offer both white, tooth-coloured, porcelain fillings and metal composite fillings to suite your individual needs. Dentures can be used for a full mouth restoration – when all the teeth on the upper or lower part of your mouth (or even both) need to be replaced. If you find you have tooth sensitivity or damage from grinding your teeth at night, a custom night guard or mouth guard can help protect your teeth and prevent further damage. If you or your child play sports like football or basketball, you might want to use a custom mouth guard to protect your teeth.